I had done it about three or four years ago with Tim Jenkins, but when I tried to explore the route last year with a couple of friends we ended up at the Hole in the Wall and came back through the hidden forest. That was quite an adventure in itself. 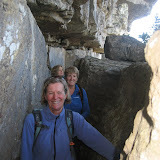 It was therefore good to do it with Karen, who knows the route well and also showed us how it links with the Hole in the Wall Route. The path is clear in most places, but not always. It is essential to do the route with someone who knows the way. 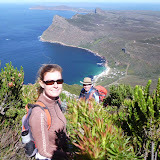 We had tea at the end of the ‘Overhang’ trail, enjoying looking down into Orangekloof and over Hout Bay. The path to the top of the ridge and then down into the valley below is not clear and you really have to look for the cairns. Once in the valley, the path links back to the concrete road and Overseers Cottage around the corner. By no means the longest or the toughest section of the trail, nevertheless it is a good five to six hour walk with an uphill pull at the beginning and a steep downhill at the end. A word of warning, although the path is good on the descent to Smitswinkel, there is some easy down hill scrambling (hands need to be used) and there is some mild exposure on a narrow ridge, that may be challenging for those who suffer from severe vertigo. There are no ledges or cliff faces however. It was a cool day with a slight breeze, ideal for hiking. Looking up from the start, the ascent to the top of Swartkop looks steep, but the zig zag path up from the mule track to the Blockhouse, makes the going reasonably easy. The path is good, although overgrown by stands of magnificent proteas in places. It is a bit steeper from the Blockhouse Gap (437m) to the highest point of the peak (678m). This was a good place to stop for tea, in a sheltered spot slightly down from the ridge. The views from the top are quite stunning, overlooking Simon’s Town and False Bay on the one side and the Atlantic Ocean on the other. From the top there is a fairly sudden descent into the valley below and you can see the path stretch up on the other side. The path is clear and although it is steep, it is a reasonably easy walk, follow by a long slow trek up the other side. The views are changing constantly and the flora is wonderful, with some outstanding examples of both pink and white King Protea and plenty of sunbirds and sugarbirds around on the day. 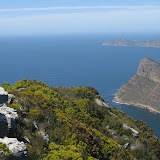 The path undulates up and down until the final short plateau provides a vista over the Cape of Good Hope Nature Reserve and beautiful view all the way to Cape Point. Just after this you start the very steep descent down to Smitswinkel Bay. The wind had come up a bit at this stage but we were able to find a sheltered spot to sit and admire the view and enjoy our lunch. The path is good all the way down, although overgrown with proteas in places. You need to be careful as there are some places where you need to use both hands and feet. We took it fairly slowly and I was lucky to spot a Table Mountain Beauty butterfly that sat still just long enough for me to photograph. At the bottom there is a stand of huge protea bushes and the presence of the long tailed sugarbirds was particularly noticeable. The path ends at the superb Smitswinkel Bay tented camp. Although we were not staying overnight on this occasion it is certainly the most luxuriously appointed of the camps and well worth a visit.